At some level, I’m quite in touch with my German heritage. Cabbage, whether braised or pickled, frequently graced our table while I was growing up. As winter approaches and the farmer’s market thins out, I become drawn to the vegetables that are still available. Even in southern California we have seasonality with our produce (despite the fact that tomatoes are still available). Angela dislikes cabbage and so it takes several weeks before I’m willing to indulge myself. It’s hard to make just a little bit of cabbage and it takes time to properly cook it. I also need to prepare myself for it. My particular preference is for the red varieties. To me, they have a deeper flavor. 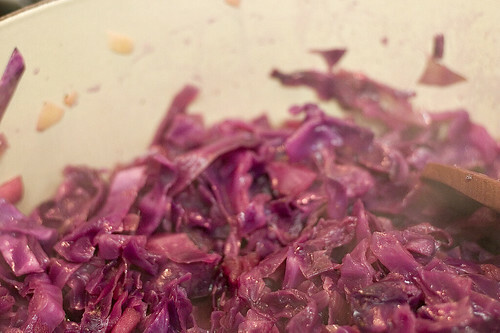 I specifically remember having some outstanding braised red cabbage in Germany (as well as excellent sauerkraut); I barely remember any sausage or pork roast that I ate. That may give you some idea of my appreciation of good cabbage. I bought this copy of Saveur in the airport to read on our flight to Florida for Christmas (and then our unexpected “vacation” in Milwaukee). 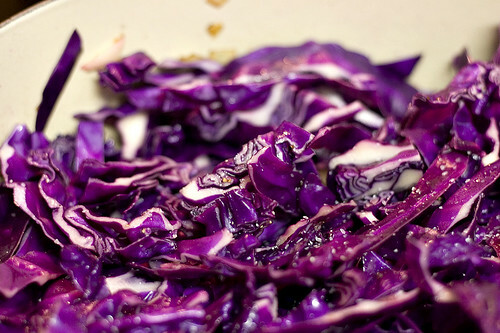 While looking through it, I happened upon this recipe for braised red cabbage. And, then and there, I knew I’d have to make it for myself. So what that it serves 6 to 8? I apparently will have to eat leftover cabbage for the next week (I found out today that it works pretty well stuffed into a pita with leftover pork and reheated). Sometimes dealing with the leftovers is worth the initial splurge. 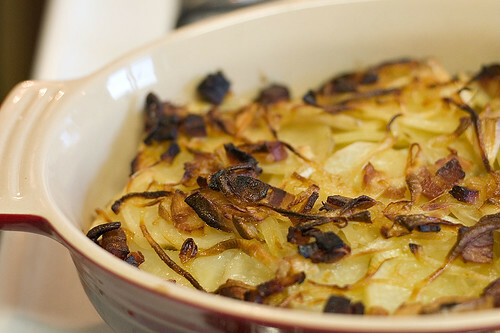 Heat the vegetable oil in a large dutch oven over medium-high heat until hot. 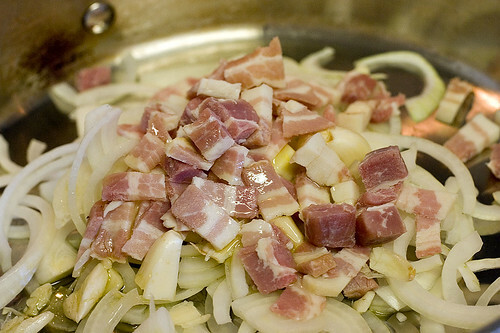 Add the bacon and cook until crisp, about 5 minutes. Add the sugar and cook for 30 seconds, stirring occasionally. Add the onions to the dutch oven and season with salt and pepper. 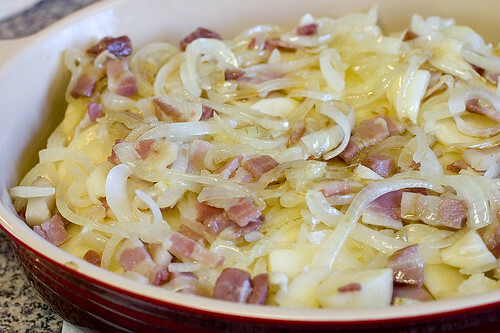 Cook until the onions are soft, about 10 minutes. Stir in the apples, cover, and reduce heat to medium-low. Cook until the apples are soft, about 8 minutes. Add the port, vinegar, and cabbage to the dutch oven. Stir to combine. Cover and cook until the cabbage is slightly wilted, about 7 minutes. Add the chicken and beef stock and season with salt and pepper. Increase heat to high to bring to a simmer. Cover, and decrease heat to medium-low. Simmer for 1 1/4 hours until the cabbage is tender. Uncover and stir in the red current jelly. Season with salt and pepper and cook for4 to 5 minutes more. I think I’ve made my love of bacon well known. 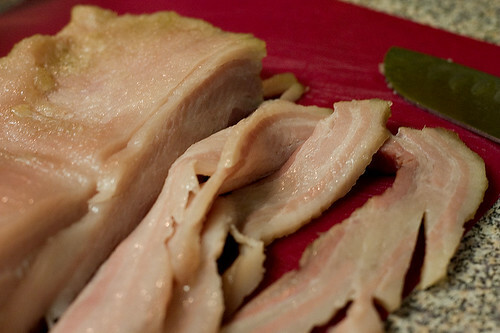 And after making pancetta, what else could I do but make homemade bacon? I don’t need to bring home the bacon ’cause I made it myself. And, yes, my jokes are that corny in real life. I actually bought the pork belly on a whim the last time we were at an Asian grocery store. I didn’t initially have any plans for it but Angela pushed for me to make bacon. How can you resist a woman who requests bacon? And, yes, that does make my wife the best ever. 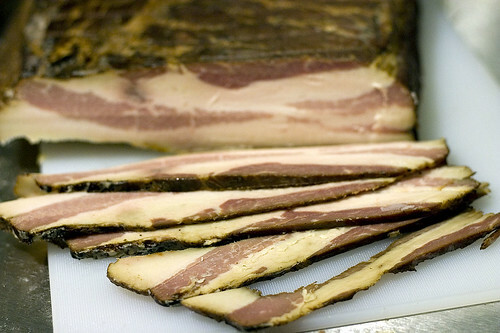 This bacon is a bit different than what you usually procure in a grocery store. The main difference being that it isn’t smoked. I would smoke the bacon but a second floor apartment doesn’t make that easy. 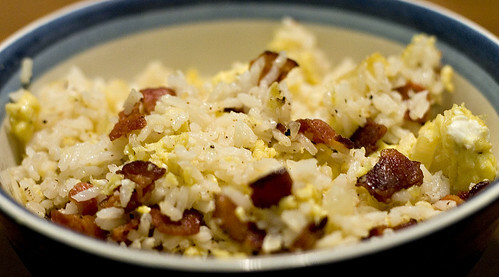 This is actually a lot easier to make than the pancetta. It doesn’t have the flavoring ingredients that the pancetta does. It also isn’t dried like the pancetta but is instead roasted. The flavor of the bacon is quite good. The bacon and pork flavors are much more pronounced. It’s almost too much (but isn’t). You’d need to be careful using it in a dish where bacon is only one of many ingredients or the bacon may overwhelm all the others (but maybe that isn’t a bad thing). Trim the pork belly to a rectangular shape. Mix the kosher salt, dextrose, and pink salt together on a wide low sided tray. 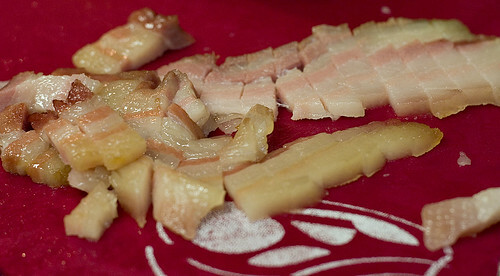 Dredge the pork belly through the salt mixture until it is covered on all sides. Place the pork belly in a large zip top bag and place in the refrigerator. Let it refrigerate for 7 days, turning it over every other day. After 7 days, the pork belly should be firm. Remove the pork belly from the zip top bag and rinse it under running water. Dry it with paper towels. Cook the pork belly in a preheated 200ºF oven on rack over a backing tray until it’s internal temperature reaches 150ºF, about two hours. Remove the pork belly from the oven. Using a sharp knife, cut off the skin from the pork belly. Allow the pork belly to cool completely. 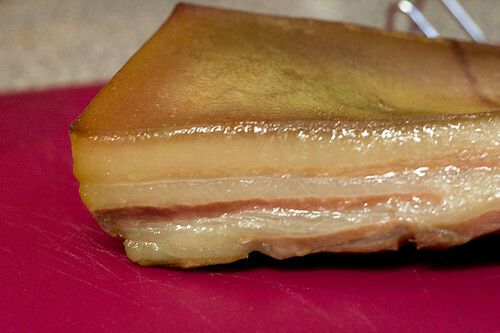 Cut the pork belly into slices of bacon. It can be kept in the refrigerator for up to 2 weeks or freezer for up to 3 months. 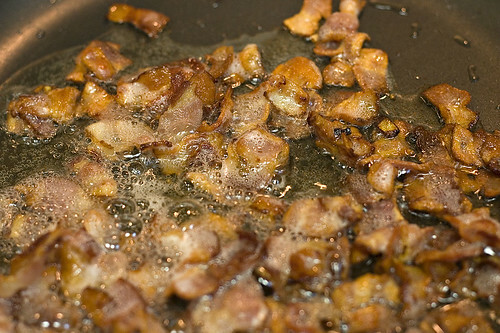 To eat, cook like normal bacon (fry or bake). Makes 2 to 4 lbs. of fresh bacon.